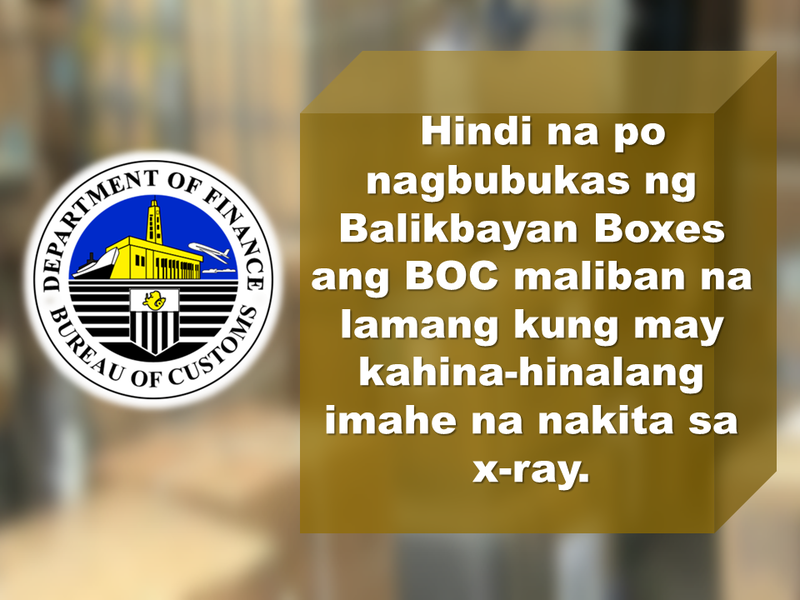 The new rule about the balikbayan boxes via Customs Memorandum Order 04-2017 is a hot issue for all the OFWs. 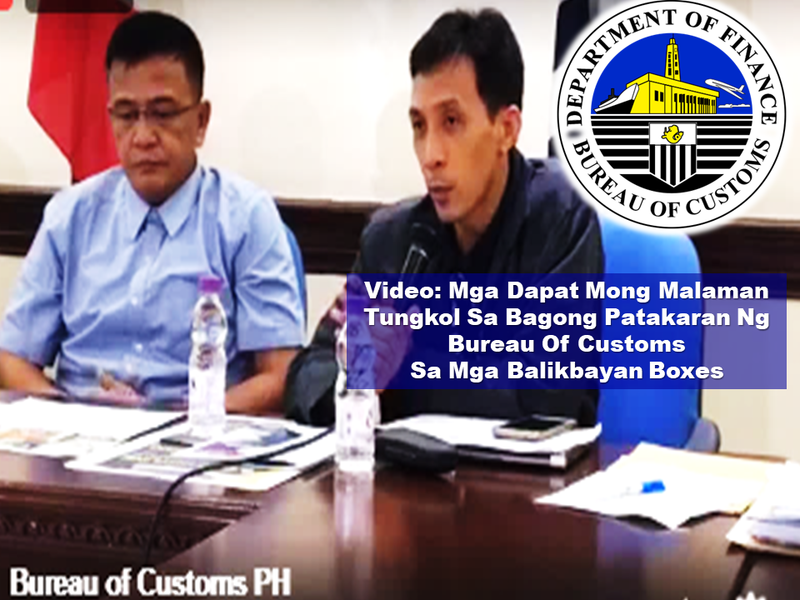 The sudden implementation which will begin on August 1, has already built confusion and worry among the balikbayan box senders despite the assurance of the BOC that this will not affect the OFW balikbayan boxes. 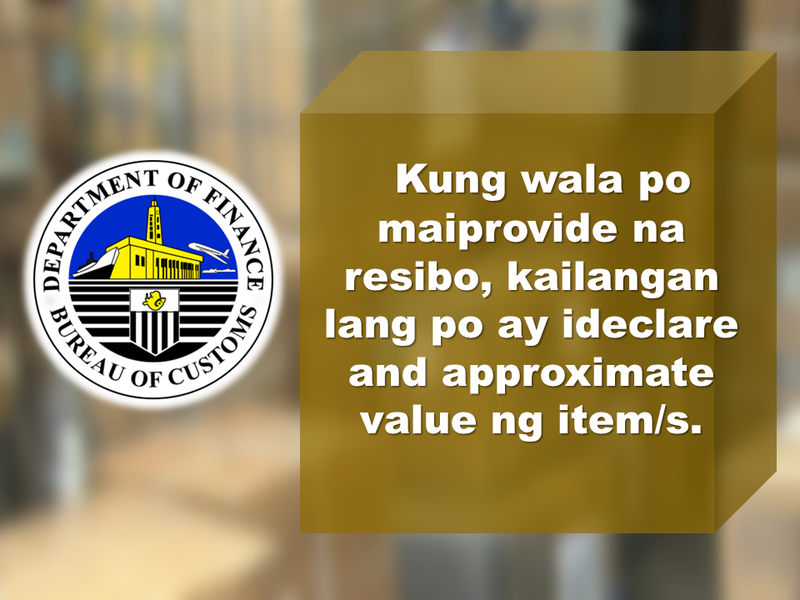 Bureau of Customs clarified that they are doing this measures to fight illegal smuggling and the legitimate OFWs should not worry about it. 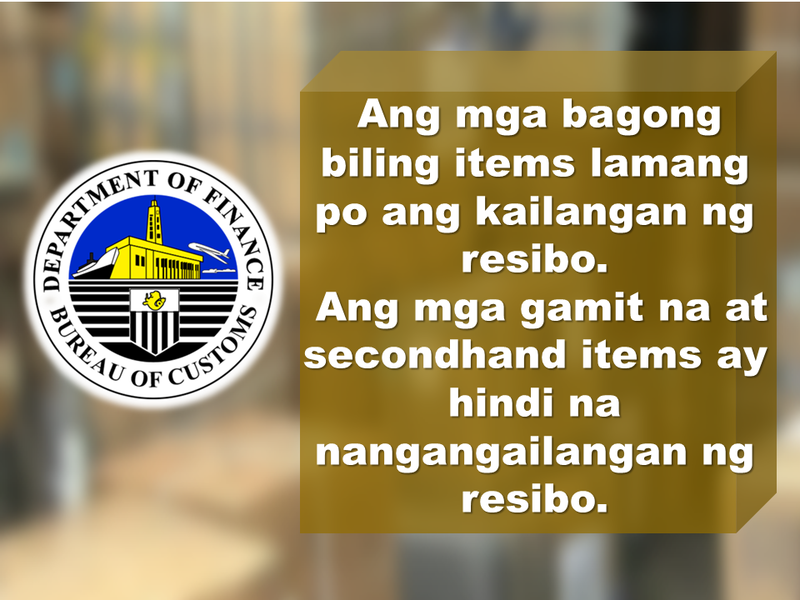 BOC also said that this is also being practiced in other countries and there is nothing new about it. 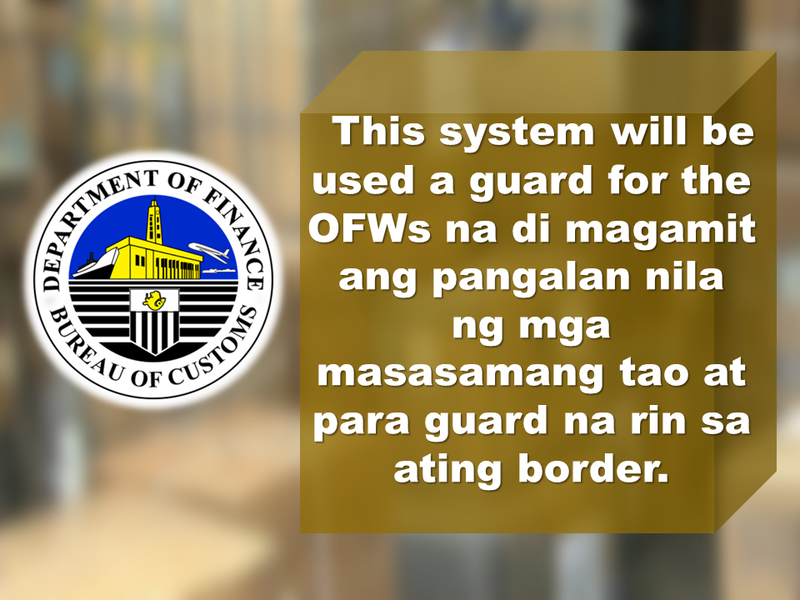 Bureau of Customs also said that the system will be used to avoid the names of the OFWs being used by illegal smugglers and to protect our borders against illegal drugs and firearms. 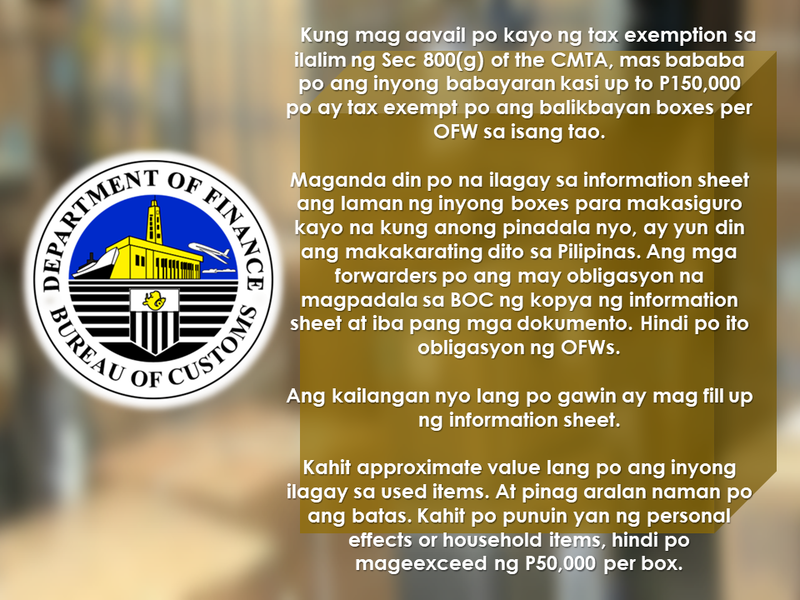 OFWs has privileges and tax exemptions pursuant to the Customs Modernization and Tariff Act Section 800 (g) of up to P150,000. 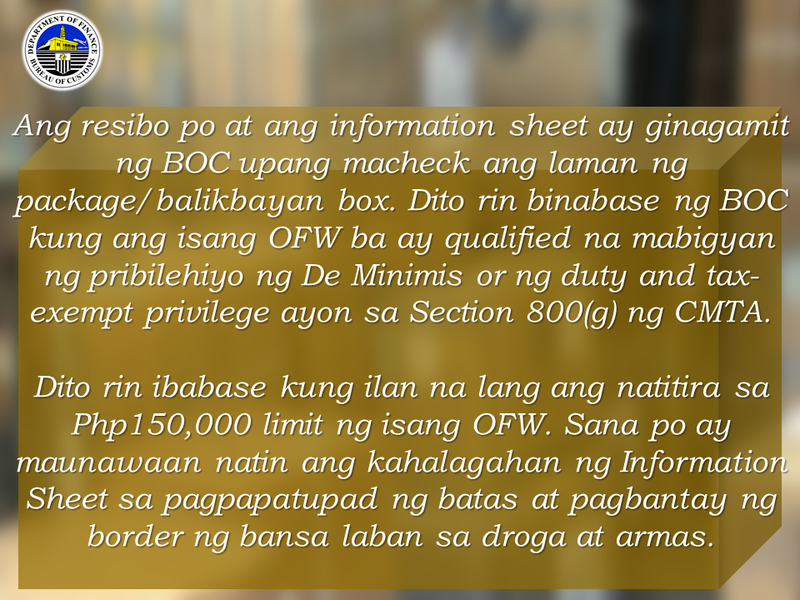 However, to avail the said privilege, they must follow the new rule under CMO 04-2017. 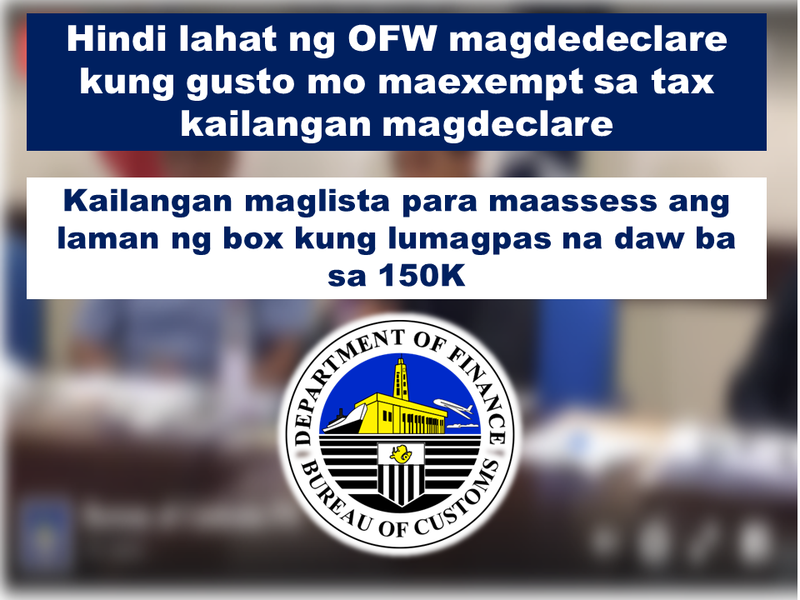 If anyone, including the OFWs do not want to avail of the privileges and tax exemptions, they can disregard the rule and send their balikbayan boxes but the BOC will charge the appropriate duties and taxes at a regular rate. 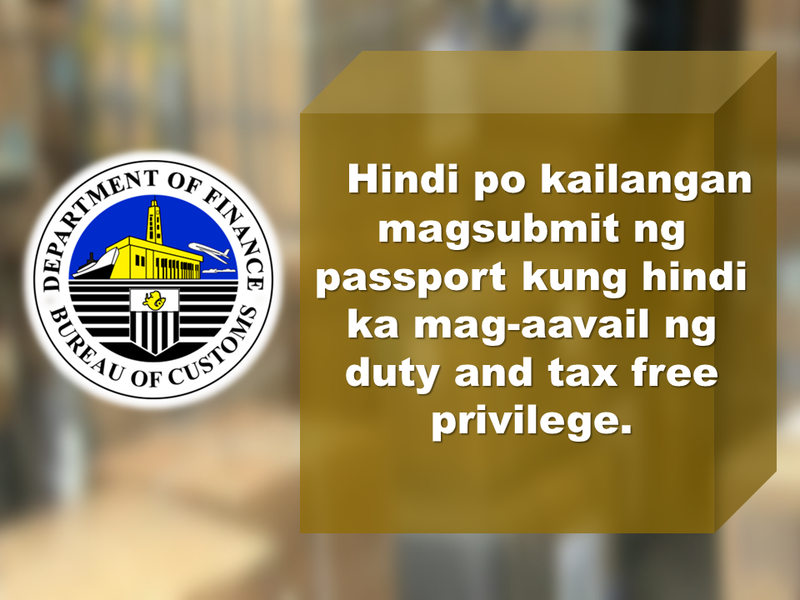 OFWs who wish to avail their privileges should comply with the regulation and submit all he needed documents such as the information sheet from BOC, receipts of the brand news items they purchased abroad, and the copy of their passport. 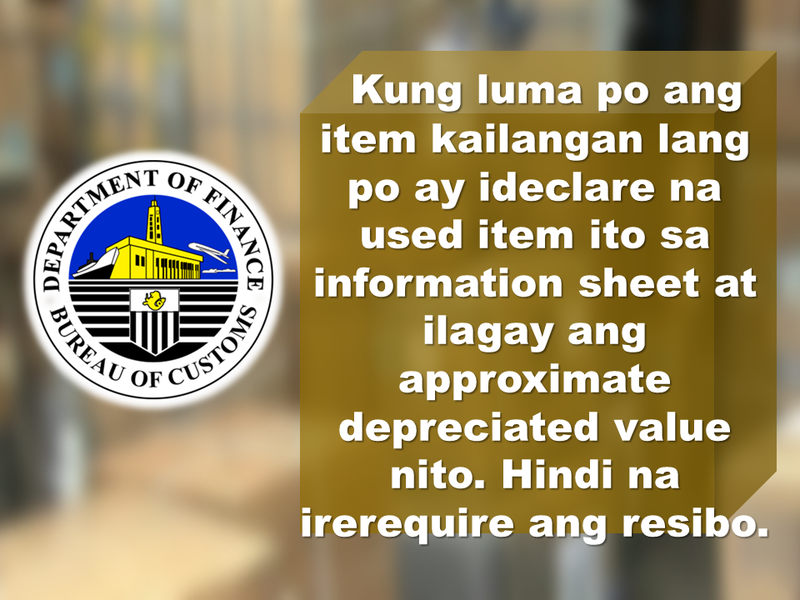 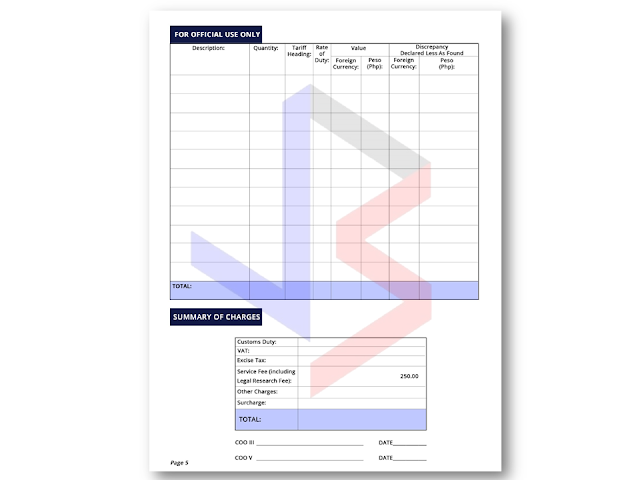 However, for second hand items, receipts are no longer required provided that the sender will declare its depreciated value on the information sheet. 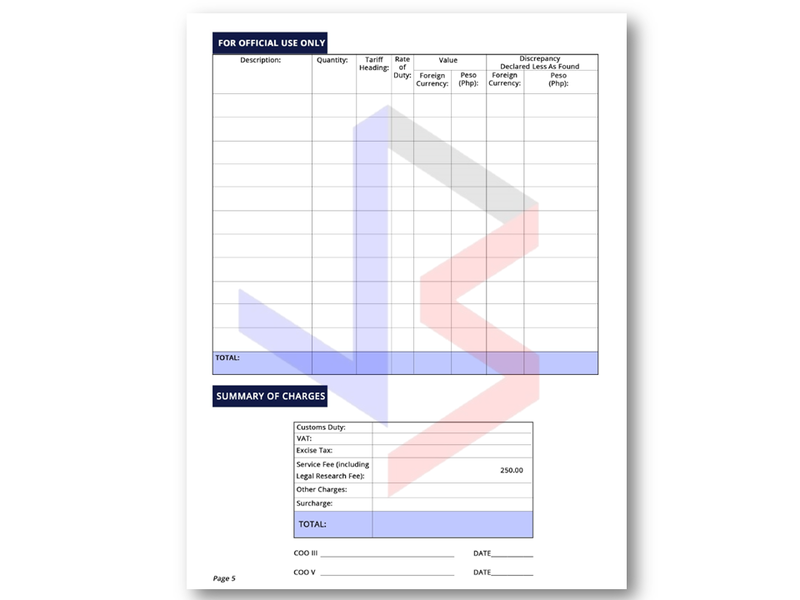 If the receipts are missing or misplaced, the sender should declare its approximate value on the information sheet. Commissioner Nicanor Faeldon ensured the OFWs that there will be no opening of the balikbayan boxes. 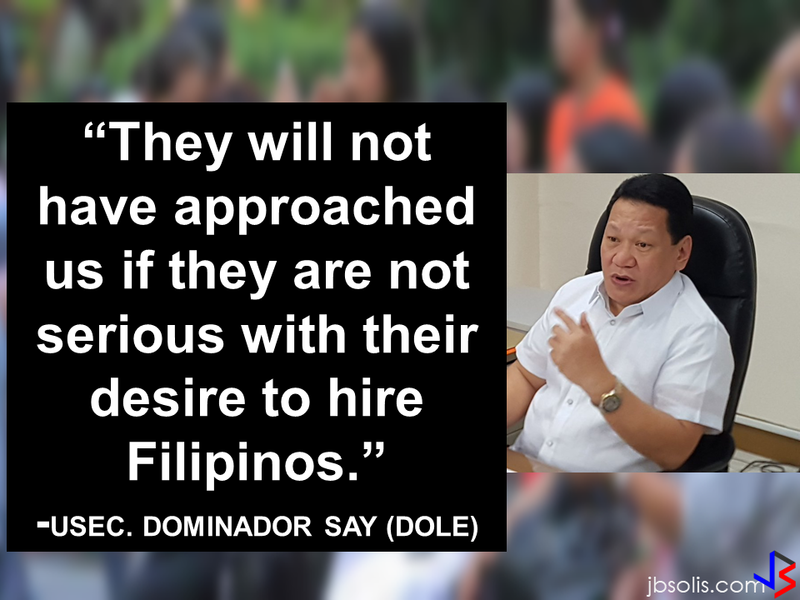 He said that the Bureau of Customs rely on the honesty of the OFWs. 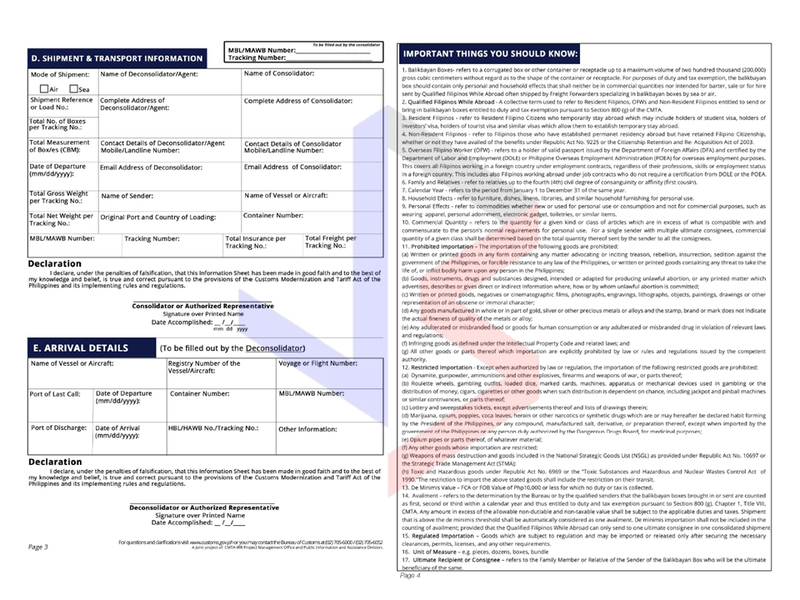 The boxes will run on x-ray scans and if they found suspicious items in the box, that's only when they will be prompt to inspect the contents of the suspicious box. 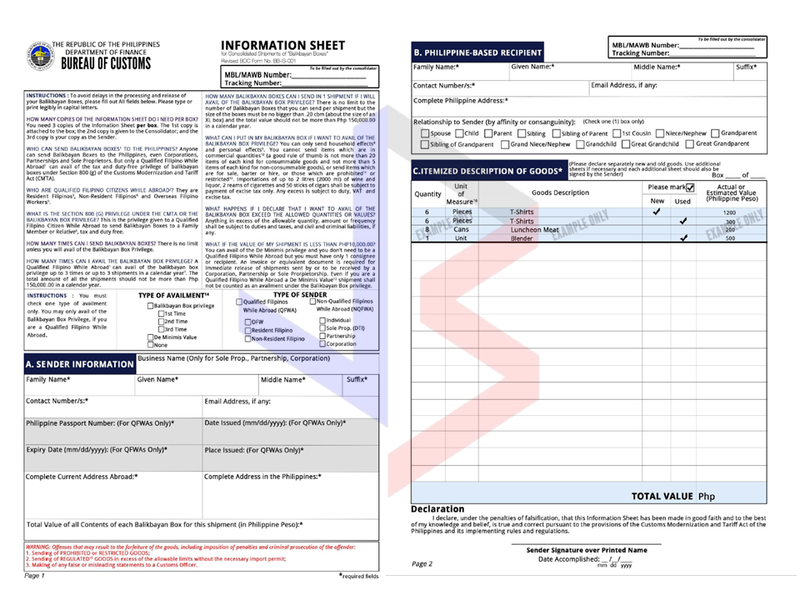 To download the 5 pages information sheet, click here.